Lee Sangheon – the man who produced turned Kim Jinya’s solo dribble against Brazil U17 into an assist for Jang Jaewon – has, unexpectedly, become one of the undisputed starters for Shin Taeyong’s side. The Han Chanhee + Lee Sangheon combo has become coach Shin’s go-to midfield duo as of late, surprisingly displacing Lim Minhyeok and Lee Seungmo (which midfield duo is best for which situation we will discuss later). For those of you who remember, LSH was the FMOB (“first man off the bench” – Jinseok Yang) for all of the games at the 2015 U17 World Cup except against England (where we rested key players). But even as a substitute he was quite spectacular, most notably dribbling past three Brazilian defenders on his own before taking a shot that was well saved. You will see that Lee Sangheon’s hashtag reads “폭풍드리블” – and indeed Lee Sangheon’s dribbling skills are top notch, for U20 standards at least. Yet Lee Sangheon is a player who doesn’t stand out – Lee Seungwoo for example wows fans with flashy skills, while Cho Youngwook gets fans excited with “linebreaking” (I still think that term is hilarious btw). LSH, on the other hand, quietly gets the job done, keeping counterattacks going or beating his marker to pass it forward. He’s also physically quite strong despite a seemingly small body frame – he withstood a lot of pressure to assist Jang Jaewon’s goal, for example. When he was at Ulsan Hyundai HS, the team was pretty much built around him, and indeed his offensive prowess (he played CAM I believe) took Hyundai HS all the way to the top of the K League junior table and to a number of youth team trophies. He lives in constant worry – during the U17 World Cup, even though he was playing very well he was always wondering “what would happen if I got cut?” [from the starting xi / squad] and always worried about his place. I’m sure he worried about his inclusion into the U20 as well. He is like a [biological] brother to me. He is very talented – he has the basics down and dribbles very well. Now he should just play with more confidence, play to his strengths, and show the world what he can do without regrets. He only thinks about football. He is an extremely talented attacker, and his prowess in driving the ball forward is truly impressive. Lee Seungmo is one of the more interesting players on the squad. From playing center defense back in 2014-15 to playing attacking midfield as of late to playing defensive midfield for the U20 team – this guy has been through everything that isn’t goalkeeper. The funny thing is, he’s good at everything. He’s a solid DM, played very well for Pohang as an AM, scored THAT wonder goal against France, and filled in so well for the injured Choi Jaemyung at the 2015 U17 WC. As a graduate of Pohang’s famous Pohang Jecheol HS, Woo Chanyang and Lee Jinhyeon have a lot of intel on him. And apprently, when Lee Seungmo first came into Pohang, they saw a scrawny, short kid who everyone thought wasn’t even an athlete – until he showed his stuff on the pitch. Since then he’s bulked up and gotten much taller. Lee Jinhyeon describes LSM as a jack of all trades, and an all around very solid midfielder. Back in high school, if the game wasn’t going very well, the coach would frequently move Seungmo up the pitch in the second half [최전방 usually refers to AM or FW]. Every time this happened, we played 만화축구 [cartoon football – like the ridiculous plays you see in soccer anime shows]. He could conjure up unbelievable plays to score goals. It’s unlikely this will happen in the U20 WC due to the depth in attack, but it’s a viable option for STY. Captain Han Chanhee – the star behind Jeonnam U18’s resurgence – has really stepped up to become one of the team’s most reliable players. If you asked me to name the best performing 3-4 players after every friendly in the last couple months, I would put Han Chanhee in all of them – he’s absolutely been central to this team. Han actually performs all the roles that Ki would. Shield the back four; work around opposition pressure; ball keeping; making through-passes; getting forward and taking shots – Han Chanhee really performs so many roles for this team it’s unbelievable. He’s scored a number of important goals as well, most notably the long ranger against the Brazil friendly last year. Since elementary school Chanhee has been bright and cheerful. He was the mood-maker for us…he gets along with everyone and makes everyone comfortable. Interestingly, his play is very serious and does not fit his personality. His passes are crisp and precise, and knows how to control the tempo of the game. Everyone konws that his mid- to- long range passes are very accurate, but his real strength is his ability to read a situation and quickly make a decision. He’s very quick witted. He is always looking around his surroundings so his choice of passes are very sound as well. There are many times where I see Chanhee’s pass and I think “if it wasn’t for that pass we wouldn’t have been able to create that dangerous situation. From the first time I met him he was very easy to talk to and we became friends very quickly. As for his play, he solves problems in the midfield. His range is very wide, and I was very surprised at the passes that he sent me because not very many people can see the passes that he sends over. He plays a huge role in the attack, and since joining Jeonnam Dragons from high school, his passing strength has increased, as did his endurance and leadership qualities. It really speaks volumes that these two teammates have so much to say about HCH. Lim Minhyeok is also one of my favorite players on this team. I knew he was skilled from the original U18 Suwon Cups, where him and Kim Junghwan stood out the most, even more so than Paik Seungho or Han Chanhee. I’ve even seen him mess up severely playing for FC Seoul’s first team. But then I saw him play against Ecuador and ever since I have been enamored by Lim Minhyeok’s play. You guys know I don’t like comparing our players to European stars (Sonaldo, Kirrard, etc.) but Imiesta – that really captures what Lim Minhyeok is aspiring towards. People have asked me why Han CH starts over Lim MH. Personally I believe that HCH starts over LMH because he’s more reliable and consistent. LMH can produce some real magic in a pinch, but doesn’t have Han Chanhee’s physicality, work rate, or pass accuracy. LMH produces the magic dribble once in a while, but Han can beat a man as well from time to time, and is less likely to lose the ball. Maybe this is like the difference between NT-SHM (not Tottenham SHM but KNT SHM) and NT-KSY? I’ve shared this video many times – as with most ball touch videos watch it only if you have time to burn. Most of the footage is plain, but there are still a good number of very impressive scenes in there as well. I met Minhyeok hyung for the first time when joining up with this team after the 2015 U17 WC. We were roomamates then – Lim had such a reputation and charisma that it was hard to approach him at first, but hyung approached me first and talked to me. We became really close while training at FC Seoul. There’s a road leading up to our clubhouse that we walk along every day – we conversed a lot on that road, from our girl problems to concerns about our future. When asked the first thing that comes to mind when it comes to Lim Minhyeok, Kim Minho chose 승부욕 (competitive but without the negative connotation), and Yoon Jonggyu chose “exquisite technique.” Kim Minho says that Lim Minhyeok hates it when he loses any physical battle (gets pushed off the ball). “He battles for the ball with zeal and is determined not to lose”. And according to Yoon, “Seeing him reminds me so much of Iniesta. I don’t think there exists a midfielder who plays like Lim Minhyeok. His individual technique really is quite Iniesta-esque. I really do agree with Yoon Jonggyu’s words. Lim really is unique – he’s obviously very raw still but the skill really is evident. Lee Jinhyeon – the late bloomer who shocked everyone with his play at the Adidas U20 tournament – is yet another Pohang product who will be looking to make an impression on the world stage. His first game for the team was against Honduras – the first match of the most recent 4-nation tournament – where he produced two assists on set pieces and impressed with his passing and ball distribution. The man himself, reflecting on the tournament, said that he was satisfied with his linkup play and assists. He states that his physicality was poor in high school, but after entering Sunggyunkwan, coach Seol Kihyun really helped him pull his physicality up. And it seems to have worked, because Lee Jinhyeon is not one to ever get pushed off the ball like Lee Seungwoo. Lee JH is also a leftie, but uses both feet fairly well, can play on either flank, and has a very good eye for the defense splitting pass. He makes everyone around him happy. I met him for the first time at the recent Adidas 4 Nations Cup, and I saw that he was quite the extrovert, very good at interacting and conversing with people he had just met. It turns out he’s extremely good at vocal mimicry – when we’re laying down he starts muttering some things and it turns out he’s imitating someone’s way of speaking. He can imitate anyone, from coach Shin to the Shoot for Love organizers. Jinhyeon hyung is very good at buildup play and holding onto the ball. Despite his height he never gets pushed off the ball and wins most of his physical battles. It seems to me he also has very good body balance – before one match I specifically told him “watch for me when I break into the box.” and he sent some extremely good passes my way. I really admire his ability to escape from opposition pressure – I often see him in situations that make me think “I sure couldn’t find a way out of that situation,” but Jinhyeon hyung always somehow finds a way out of them. His ability to hold onto the ball is fantastic, as is his first touch. His dribbling and speed are very good as well. He could be a little taller, but other than that, he has all the basics down. The really interesting thing about Jinhyeon hyung is that even after taking an extended break his fitness is always top notch. I’m fairly certain he exercises on his own on a regular basis. Kang Jihoon is back from his slump as a revived man. He was the star forward during Ahn Iksoo’s tenure – he was hands down the best source of goals for Ahn Iksoo – but injury and the transition to college and U-League got to him for a bit. Now, fortunately, he is back at his best, the most obvious sign being his scissor kick against Uruguay. Kang Jihoon likes to use his speed and cut in to shoot. When he runs at you at full speed he ‘s really hard to mark. His attacking prowess is truly incredible. His greatest strengths include an ability to penetrate defenses, movement, and work rate. Before the England game, he came up to me and said “If I make an early ball touch like this [demonstration], would it make it harder for the fullback to mark me? I said “yeah I think so!” And the next day, Jihoon pulled the exact move on England’s right back and scored that amazing goal. It reminded me how intelligent Kang Jihoon could be and how amazing his shooting ability can be. 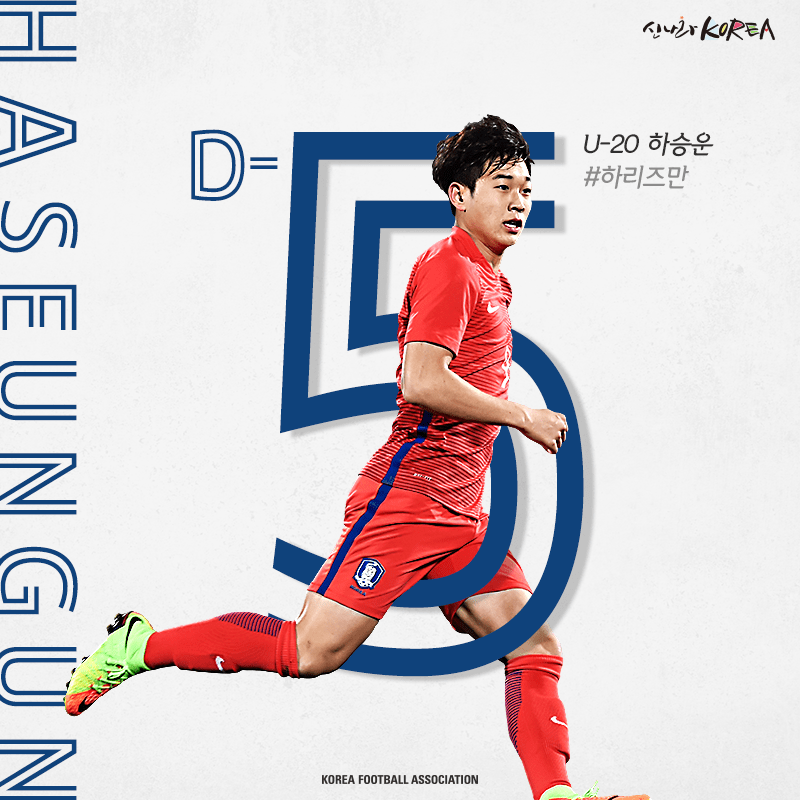 Kang will probably come on as a sub for this tournament due to the presence of LSW and PSH, but I do expect him to score a goal sometime during the time – just because he has been a reliable source of goals throughout the run up to the tournament. Ha Seungwoon – a bit of a forgotten man due to Cho Youngwook and Kang Jihoon, but he is truly talented in his own right and is the deserved striker and sub player. Our high schools played against each other our senior year. At first I thought that Seungwoon’s ball touch was quite out of the ordinary / unique. Our team won in the group stages, but in the round of 16 we lost to a fantastic goal from Seungwoon – I was right about his touch. He is very bright and innocent. I think he’s better than me in technique, and he’s better than me when it comes to cutting in from the flanks. Our style is similar so when we play together we link up very well. Lee Jinhyeon once stated that if Youngwook is more like Sergio Aguero, Seungwoon is more like Lacazette. Make of that what you will. Cho Youngwook – what a prodigy this kid is – to be two years younger than everyone but still managing to stand out quite a bit – it’s incredible. Very similar to Hwang Heechan. Skillful, fast, very good at running behind defenses. Well built and has even knocked down defenders while running forward. A little more on his past: it’s incredible that this guy started football so late (in 6th grade!!!) and got as famous as he did at Eonnam High School. However, he was not chosen for the U17 World Cup; this, he said, was his greatest motivation for having to improve. Cho Youngwook’s breakout stage was the 2016 May JS Cup, where he scored an amazing goal against Japan and played very well in the other games as well. Since then, he’s been racking up goals. He scored two against Bahrain, one against Nigeria, a couple during the Portugal friendlies, and one against Senegal. Now, he is unquestionably the player to lead the line at the U20 WC. I met Youngwook in our penultimate year of HS, and he was so famous even then. He was so strong and powerful our defenders were afraid. He looks very nice and baby-faced but he’s so dangerous on the pitch. His strength really shows when he is sprinting alongside a defender to fight for the ball. He really is a pain for defenders. Paik Seungho – I first remember when this guy moved to Barcelona back in 2010. He made waves along with Kim Woohong who went over to Real Madrid Castilla instead. I got very excited about this and started getting active online trying to find more information. Those were some real good times (back when Paik was so much shorter than everyone) but now Paik has grown and matured considerably, and is gearing up to challenge the world at the U20. When we were elementary school students, my team (Shinyongsan) was to face Daedong, and I heard that there was a very good player there by the name of Paik Seungho. I thought to myself, “How good could this little kid possibly be?” We were up 1-0 when Paik came on at halftime as a left winger. All of a sudden, he ran down the left flank and scored with his left foot on an outside-the-foot shot. To think that a elementary school student could pull off a leftie outside-the-foot shot! Baek Seungho is a great friend. He is very cheerful, reacts well, and we tell each other about all our concerns. While Seungho was in Spain we called each other often, and we see each other when he comes back to Korea. His pass timing is amazing. We have played together many times, and our combination play is actually quite effective. At the Adidas Cup, Seungho hyung assisted my second goal against Zambia – it was a goal he served for me on a silver platter. I want to make plays like that again at the U20 World Cup. I think in his age group, there is no better player better than Seungho hyung. Make of that very last sentence what you will. Lee Seungwoo. We all know this guy right? Do I need to say anymore?